﻿The cost of opening an online store is lower than ever before. Yet, launching a new business carries a certain amount of risk. Any number of things can go wrong: your marketing plan might not pan out as expected, you can run into inventory issues, or people might simply not like what you have to sell. One way to reduce the risk with an online store is to buy an existing online business. Instead of testing the waters with an unproven idea, you can buy a store with established customers and proven demand. If you choose this option, you have to do your due diligence and double check all the seller’s claims. Follow this checklist to ensure that you buy a proven business. What’s included in the sale: At the bare minimum, you should get the domain, website, customer list, and all social accounts associated with the site. Check if you also get existing inventory, staff, accounts receivables, and IP. Financial documents: You should have access to verified bank statements, PayPal statements, or any other documents that show the business’ revenues and expenses. Legal: How is the business structured — LLC, LLP, or corporation? Are there multiple owners? Are the business and the store domain owned by the same person? Check that you understand all the legal issues associated with the business. Business model: What business model does the store employ — dropshipping, wholesaling or manufacturing? Do you get the contacts of suppliers? Sales channels: How does the business sell its products — through its own store, marketplaces (like Amazon FBA), or physical stores? Are its marketplace listings and accounts included in the sale? Profitability: Whether the store is profitable after paying all wages, taxes, and shipping, and inventory costs. You’ll map the profitability trends later when you run a financial audit. Start your business audit by evaluating the store. Go through a number of pages to get a feel for the products, copy, and design. Try placing a test order. Ideally, this experience should be smooth and error-free. Enter the website domain on GTMetrix. This will test the website from a number of locations and evaluate its speed, mobile responsiveness, and overall performance. Besides checking the store’s UI/UX, take some time to verify the authenticity of any pictures or copy used on the store. A store using fake reviews or text is a big red flag. How are the pictures of each product sourced? Are there any copyright issues associated with the images? Who writes the copy of each product? Is the copy original or copy-pasted from a dropshipper or wholesaler? Check for originality by using a tool such as Copyscape. How are reviews collected? Are the reviews from verified customers? Finally, check how the store is perceived online. Google the store’s name and URL. Look for any complaints, reviews, and testimonials. Have any bloggers or media sites written about the store? If yes, what were their opinions? What are the business’ ratings on Better Business Bureau (especially for US/Canada based businesses)? Has the store won any industry awards or trust certifications? Are there any scam reports associated with the business? Search for [business name] + scam to find these reports. It can take months, even years to build-up traffic to a website. If a store has existing traffic, you get a strong foundation for future growth. Traffic is one of the top things you should analyze when you buy an online store. Ask for access to the store’s analytics (usually Google Analytics) to get a detailed picture of the store’s audience. Is the traffic going up or down year over year and month over month? Does the traffic spike during any specific period? If yes, why? If there is a traffic spike, does it correlate to increased revenue? If yes, can it be repeated? Every store will have some traffic patterns (higher traffic on weekends, after work hours, etc.). What you should look for are general traffic trends and scalable sources of new traffic. While an upward trend in traffic is nice, you also want to have the right kind of traffic. What are the top sources of traffic to the website? Does the store depend too much on a particular source? If yes, is this traffic sustainable? How much of the traffic is from scalable sources (such as paid advertising)? How much of it is organic (such as SEO)? Does the store get a lot direct type-in traffic? This can imply that the store has a strong brand recall with its audience. What are the trends for each traffic channel? Is organic traffic increasing/decreasing? Ideally, the store should get traffic from multiple sources in proportionate amounts. You should be able to scale traffic if possible. It should also not rely too much on any specific channel. Besides trends and sources, you should also evaluate the quality of the traffic. This includes the bounce rate, average time on site, and new vs. returning visitors. What is the store’s overall bounce rate? What is the bounce rate on product and checkout pages? How many visitors come back to the store? How many pages does each visitor view on average? How much time do they spend on each page? A high bounce rate (anything above 70-80%) on product pages can indicate that people don’t like the products. If very few of them come back, it can mean that you won’t have a lot of repeat purchases. Geographical location of the traffic: Does the store get traffic from your target geographical location? Is there a lot of low quality (high bounce rate, low average time on site) from some countries? The latter can indicate spam traffic. Mobile vs. desktop traffic: What percentage of the store’s traffic comes from mobile? Does the mobile traffic have a high bounce rate? If yes, it can indicate that the store doesn’t have an optimized mobile experience. Once you’ve evaluated the store’s traffic, you can move on to the most important part of any business — its financial data. If traffic data tells the story of the store’s audience, financial data tells you the story of its paying customers. There should be a correlation between traffic and financial data. Strong traffic without sales is a red flag, as is the opposite — little traffic but strong sales. Start by analyzing the business’ revenue. Is the revenue going up or down? Are there any periods of particularly high or low revenue? Map revenue trends against traffic trends. See if there is any clear correlation between the two. Does revenue go up with traffic? If yes, where is this new traffic coming from? Can you get more such traffic in the future? Revenue over sale periods (such as Black Friday). If the store’s sales are highly seasonal, it can impact your growth. As a business owner, you want diversified revenue. If too many of your sales come from a handful of customers, you put yourself at risk. What is the average order value per customer? What percentage of customers make repeat purchases? How does it correlate to new vs. returning visitors in the store’s traffic analytics? How often do customers come back for repeat purchases? Are repeat purchases periodic (monthly, weekly, etc.)? What is the average order value for repeat purchases? What is the profit margin per customer after including discounts? Is the revenue diversified? Are there any customer’s accounting for a large number of orders? A large number of repeat purchases, diversified customer base, and high average order value are all signs of a healthy business. Your store’s revenues should come from a wide range of products. If you depend too heavily on a single product for your sales, you risk losing money in case the product becomes unpopular. What are the store’s top-selling products? How much of the store’s revenues do they account for? What are the demand trends for the top-selling products? Are sales up/down YoY? How stable is the supply of the top-selling products? Do you have access to alternative suppliers? What kind of promos does the store run for its top products? How do these promos affect sales? Are there any low selling products in your inventory with a growing demand? A store with a large range of popular products and growing sales YoY reduces your risk exposure. Cost analysis involves mapping the cost of acquiring, stocking, selling, and shipping each product. It also includes the cost of refunds and restocking returned products. Essentially, it tells you how much profit you make for each product sold. It’s a vital metric for evaluating any store. What is the cost to buy each product? What is the minimum order quantity? Are there any alternate suppliers offering lower prices? What is the average shipping cost for each product? Do the products require warehousing? If yes, what are the stocking charges? What is the profit margin on wholesale for each product (especially the top-selling products)? If too many people are returning products, it can mean that they’re unhappy with the product quality. It also tells you that the customer base is low quality. The average return rate for e-commerce stores is about 30%, though this is mostly due to apparel where return rates can be disproportionately high. Among top retailers, the median return rate is as low as 3%. Compare the store’s return rate against these benchmarks. If the return rate is too high, ask the owner about the cause. An owner unwilling to discuss returns is a big red flag. After evaluating the store’s finances, it’s time to do a quick technical audit of the store. Figure out what kind of software the store runs on. Do you have the technical skills to run this software? If not, what is the software’s learning curve like? The store’s e-commerce software is the heart of the business. If the software is expensive, laggy, or lacks key features, it will impact your growth potential. Is the software hosted or self-hosted? If self-hosted, does the software have any special hosting requirements? Does the software integrate with any current tools you use? If not, does it offer an API for easy integration? What hard is it to learn the software? Are there any free training courses to help you along? Can you migrate to another e-commerce software such as Ecwid? What payment processors and shipping integrations does the software currently support? Besides the e-commerce software, you also need to make a list of all the marketing tools used by the store owner. Use the same evaluation criteria as you used above — the software cost, learning curve, special requirements, and integrations. Email marketing software such as MailChimp, Aweber, etc. Any other marketing tools used. Although not essential, matching the domain’s details to the owner’s claims should also be a part of your technical audit. 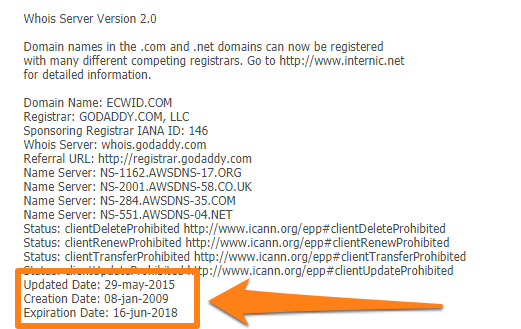 Domain age: Use a tool such as Whois.net to check the domain’s original registration date. Enter the domain into the search box and look for the Creation date. Domain history: What was on the domain before the current store? Lookup the domain on Archive.org to dig through its history. Go through a few records to see what the domain looked like over the years. If you see any dubious or spammy sites on the domain before the current store, ask the owner about it. Domain blacklists: Sometimes, mail servers and search engines blacklist a domain for spamming. 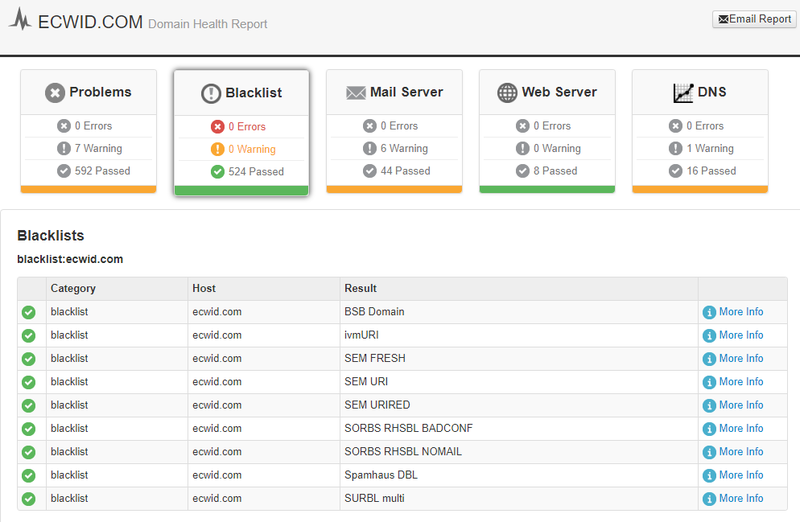 Check MXToolBox’s domain health report to confirm that the domain isn’t blacklisted. Besides the above, you can also ask the owner how he acquired the domain and how he used it in the past. Buying an existing store gives you a strong marketing foundation for growth. Even a failing store would have some search engine traffic and social media following. This makes it much easier to scale growth than starting from scratch. It’s much easier to get organic traffic if the store already has a strong SEO foundation. If possible, get access to the store’s Google Webmaster data. This will give you deep insight into the store’s organic traffic and rankings. Domain rating and backlinks: Enter the domain in a backlink analyzer tool such as Moz Open Site Explorer (free) or Ahrefs (paid). Look for a domain authority (DA) of at least 30+ with a low spam score. Keywords: Check what keywords the store currently ranks for. You can plug the domain into SEMRush to find this data. Alternatively, use data from Google Webmaster Tools to check the site’s top ranking keywords. Keep an eye out for any lucrative keywords the site already ranks for on the first or second pages. With some push, the store could easily rank in the first three results and get a lot more organic traffic. 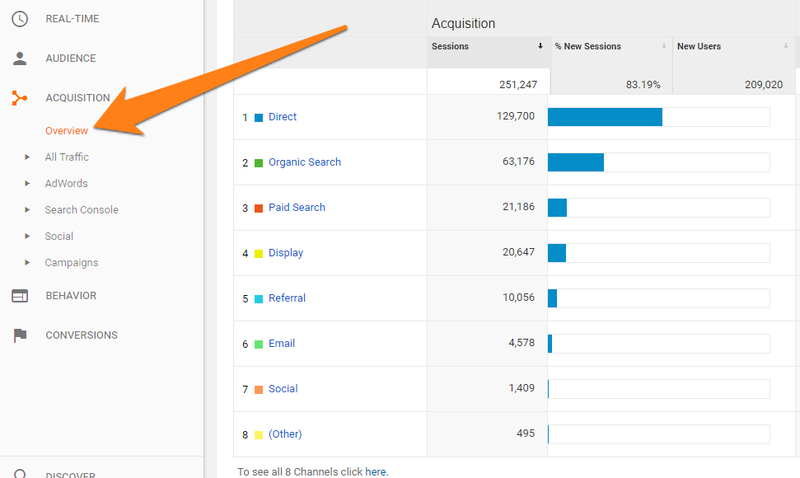 Map the keyword data against the organic traffic in Google Analytics. There should be a clear correlation between the two. Sales from each social network. Look out for any signs of organic traction on social media — an Instagram post that goes viral or a tweet with a lot of retweets. Ask if you can recreate this traffic. Also, evaluate the social performance of the store’s on-site content. 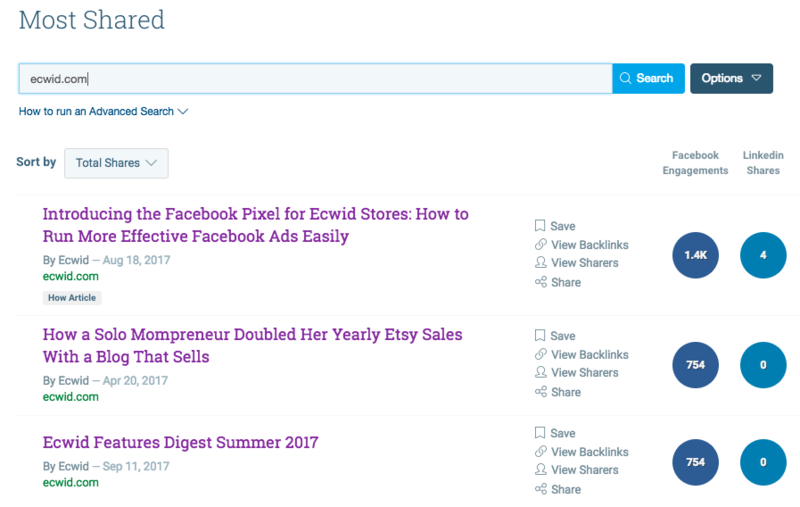 Look up the domain on Buzzsumo to find the more shared content on different social networks. The sustainability of referral traffic. For example, a store might get a lot of referral traffic after one of their blog posts goes viral on Reddit. However, this traffic isn’t sustainable — as soon as the Reddit link gets old, it will stop sending traffic to your site. Your goal should be to look for referral traffic that is more long-term. For short-term referral traffic, ask whether you can replicate the effect with similar content. Besides the above, you should also evaluate any paid traffic, its cost, and its effectiveness. If the owner advertises on AdWords or Facebook, ask for access to their data. An online business isn’t just the sum of its products and marketing; it is also the relationships it has with staff and suppliers. In the final part of your online business buying checklist, evaluate the store’s staff, suppliers, and owner. Does the store have any full-time employees? If yes, what are their wages? Where are they based out of? What are their responsibilities? If the store has full-time staff, you’ll want to be thorough with all these questions. Ask the owner to interview staff members. You’ll have to decide whether you want to bring in existing staff in or replace them with your own hires. If you choose the latter option, factor in the legal ramifications of firing them as well as the training cost of new hires. Do the same for any freelancers used by the business. Figure out their wages, their responsibilities, and how the owner works with them. The success of an e-commerce store often depends on the relationships it has with its suppliers. A reliable and cost-effective supplier can make running the store a breeze. How many suppliers does the store use? How long has each supplier been working with the store? What are the terms of the agreement with each supplier, especially regarding cancellation, refunds and shipping? Are there any alternate suppliers for the top-selling products? What are the standard procedures for re-ordering products? The process for re-ordering new inventory. Finally, assess the owner, their reason for selling and the willingness to help you with the transition. An online store can be a big purchase; you want to find someone who you can trust and work well with. Whether they’ll introduce you to their existing relationships with suppliers, freelancers, etc. Besides the above, also evaluate how important the owner is to the business. If the owner is indispensable (the store is named after the owner, or the product was invented by the owner), you might want to look elsewhere. Buying an online business can be expensive, exhausting, but also exciting. Instead of building everything from scratch, you get a business in a box with proven sales, established products, and pre-existing relationships. The more money you spend on the business, the more you should invest in due diligence. Of course, if you are adventurous and prefer to build everything yourself, you can start an online store for free with Ecwid.